Lock in a great price for Holiday Inn Express Emei Mountain – rated 8.5 by recent guests! The hotel was clean. I like it that it has a laundry facility! The Staff was nice. The breakfast was decent. The town was very nice. Quiet town. Minimalist modern design rooms. Clean and comfortable. 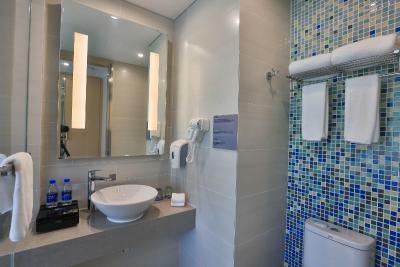 Best part is the rooms come with USB ports so you won't even need a travel adaptor! Breakfast was basic but tasty. And there's an al fresco area where you can enjoy your breakfast with breathtaking views of the mountain. Especially lovely when the weather is cooling. Also, the bus stop is just across the street from where the hotel is. Super super convenient. Actually it is a perfect place for Emeishan especially if you are a foreigner. The location is great because you can walk to the entrance gate of Emeishan area where the buses leave to the summit. Also other buses leave to Baguo temple. You have local Eateries in walking distance. The hotel orders taxis to the highspeed train station which is only a 15 minutes drive away or to other places. Staff is nice and helpful although no English. The whole area is beautiful. They seem to develop it all in kind of holiday village there. The Hotel is quite new and fits perfectly to the landscape. Our big enough room with river views and balcony, big comfy beds and a good shower was definitely worth the price. Breakfast not bad with coffee from Jura coffee machine. Such a gem of a place in Mt Emei. Great sized modern room, our had bunks for the children. The bed was comfy and clean room. Location is next to Emei National Park. Comfortable room, good variety of breakfast food, nice coffee. Staff was very helpful. I like everything about the hotel, location, staff, food and atmosphere. I decided to spend my birthday here and I hopefully I was not disappointed. Thanks a lot! Location of the hotel-it's so near to the Emeishan entrance!! And high speed train is just 5km away. Breakfast - great breakfast with Western and Chinese variety. And excellent bread and coffee!! Staff - staff were well trained and courteous. We had Sichuan dinner at the hotel, which by the way was excellent and value for money, and had the chance to be served by a particularly helpful and nice waitress worth mentioning. Her name is Ally Zu (徐青). Great work!! Overall a very good hotel. Food was excellent at the Chinese restaurant. Our take away breakfast was good. Too bad we don't hv time to try the breakfast. The restaurant staff 徐青 was very helpful friendly n provided excellent service. 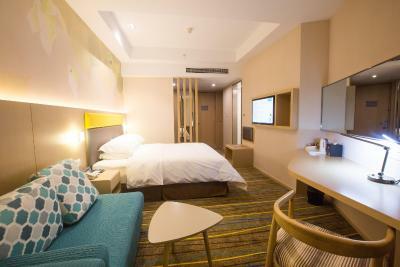 One of our top picks in Emeishan City.A 19-minute walk from Baoguo Temple, Emeishan, Holiday Inn Express Emei Mountain is located in Emeishan City and provides rooms with free WiFi. 1.8 miles from Emeishan Tour Passenger Transport Centre and 28 miles from Leidongping, the property has a garden and a terrace. The property is 29 miles from Emeishan Ski Field. Guests at the hotel can enjoy an Asian breakfast. The restaurant at Holiday Inn Express Emei Mountain serves Asian cuisine. With staff speaking English and Chinese, guidance is available at the reception. This property is also rated for the best value in Emeishan City! Guests are getting more for their money when compared to other properties in this city. When would you like to stay at Holiday Inn Express Emei Mountain? This family room has a electric kettle, air conditioning and sofa. This twin/double room has a electric kettle, air conditioning and iPod dock. This double room features a iPod dock, soundproofing and sofa. House Rules Holiday Inn Express Emei Mountain takes special requests – add in the next step! 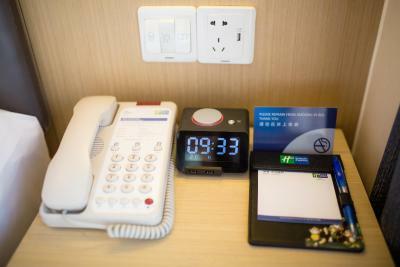 Holiday Inn Express Emei Mountain accepts these cards and reserves the right to temporarily hold an amount prior to arrival. The bed is too soft and the room can be bigger. The hotel is conveniently located next to the Huangwan entrance to Emei, which is about 2-3 km away from Baoguosi. Not much to do at Huangwan although the environment is nice and quiet and there are a few reasonably priced eateries. The hotel also provides a decent buffet breakfast spread. The bathroom door was a stained glass so the bathroom was NOT private. It was weird and uncomfortable. The water at the back of the hotel was a little smelly. The pool was closed. Nothing that I don't like! Morning breakfast was good,better than I expected. Had our dinner at the hotel restaurant,staffs' service were good as well as the food. The location and view is good, stuff were friendly and helpful. The room is clean and comfortable. The "mountain view" rooms weren't exactly a mountain view. Shops around the hotel look quite dead. Have to take a cab out to nearby towns for food. There is a construction site nearby that kept hammering all day. In addition, we almost got overcharged for the room. We had to pay attention and insist to get the reservation price. Nice breakfast. Very close to the mountain. Good location, the room had bunk beds which the kids loved! Good customer service at front desk. Check in process - staff could not retrieve our reservation, couldn't speak English. Some guests allowed to smoke at lobby. It was amazing place, near to Mt. Emei gate. Calm, quiet and fantastic localization - riverside. Good breakfast.